1. a more or less well defined portion of an organ or gland. 2. one of the main divisions of a tooth crown. azygos lobe (lobe of azygos vein) a small anomalous lobe situated at the apex of the right lung, produced when the azygos vein arches over the upper part of the lung instead of at the hilus and presses deeply into the lung tissue to form a fissure that isolates a medial part of the lung. caudate lobe a small lobe of the liver between the inferior vena cava on the right and the left lobe. ear lobe the lower fleshy, noncartilaginous portion of the external ear. flocculonodular lobe one of the main subdivisions of the cerebellum, located inferiorly, consisting of the paired flocculi, their peduncles, and the nodule of the vermis. frontal lobe the anterior portion of the gray matter of each cerebral hemisphere. hepatic lobe one of the lobes of the liver, designated the right and left and the caudate and quadrate. l's of lung the five major subdivisions of the lungs. 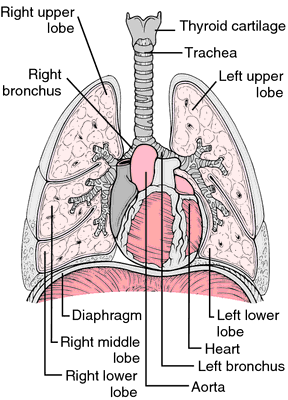 see accompanying illustration and see lung. The lobes of the lungs. From Frazier et al., 2000.
occipital lobe the most posterior portion of each cerebral hemisphere, forming a small part of its posterolateral surface. See illustration. The occipital lobe of the brain. From Applegate, 2000.
parietal lobe the upper central portion of the gray matter of each cerebral hemisphere, between the frontal lobe and the occipital lobe and above the temporal lobe. It is the receptive area for fine sensory stimuli, and the highest integration and coordination of sensory information is carried on here. Damage to it can produce defects in vision or aphasia. polyalveolar lobe a congenital disorder characterized in early infancy by the presence of far more than the normal number of alveoli in a lobe of the lungs; thereafter, normal multiplication of alveoli does not take place and they become enlarged, i.e., emphysematous. 2. a small lobe of the liver, between the gallbladder on the right, and the left lobe. Riedel's lobe an anomalous tongue-shaped mass of tissue projecting from the right lobe of the liver in some individuals. temporal lobe a long tongue-shaped process that is the lower lateral portion of each cerebral hemisphere. 1. One of the subdivisions of an organ or other part, bounded by fissures, sulci, connective tissue septa, or other structural demarcations. 2. A rounded projecting part, as the lobe of the ear. 3. One of the larger divisions of the crown of a tooth, formed from a distinct point of calcification. 1. a more or less well-defined portion of an organ or gland. caudate lobe a small lobe of the liver between the inferior vena cava and the left lobe. ear lobe the lower fleshy part of the external ear. frontal lobe the rostral (anterior) portion of the cerebral hemisphere. hepatic lobes the lobes of the liver, designated the right and left and the caudate and quadrate. 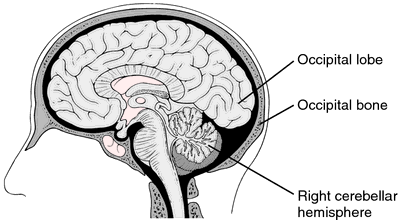 occipital lobe the most posterior portion of the cerebral hemisphere, forming a small part of its dorsolateral surface. parietal lobe the upper central portion of the cerebral hemisphere, between the frontal and occipital lobes, and above the temporal lobe. polyalveolar lobe a congenital disorder characterized in early infancy by far more than the normal number of alveoli in the lung lobes; thereafter, normal multiplication of alveoli does not take place and they become enlarged, i.e., emphysematous. spigelian lobe caudate l. of liver. temporal lobe the lower lateral lobe of the cerebral hemisphere. 1 a roundish projection of any structure. 2 a part of any organ, demarcated by sulci, fissures, or connective tissue, as the lobes of the brain, liver, and lungs. lobar, lobular, adj. 1. A subdivision of an organ–eg, liver–2 lobes; lung–2 lobes left, 3 lobes right; breast–15-20 lobes; brain–2 lobes, divided by fissures, connective tissue or other natural boundaries. See Temporal lobe. 2. A rounded projecting portion, such as the lobe of the ear. 1. One of the subdivisions of an organ or other part, bounded by fissures, connective tissue, septa, or other structural demarcations. A well-defined subdivision of an organ. Many organs, such as the brain, the lung, the liver, the pituitary, the thyroid gland and the prostate gland, are divided into lobes. 1. One of the larger divisions of tooth crown, formed from a distinct point of calcification. 2. One of the subdivisions of an organ or other part, bounded by fissures, sulci, connective tissue septa, or other structural demarcations. a small dorsally located lobe of the liver to the right of the caudal vena cava that frequently embraces the right kidney. an elevated area of skin just below the external auditory meatus in birds. the anterior portion of the gray matter of the cerebral hemisphere. one of the lobes of the liver. the most posterior portion of the cerebral hemisphere, forming a small part of its dorsolateral surface. the upper central portion of the gray matter of the cerebral hemisphere, between the frontal and occipital lobes, and above the temporal lobe. See also parietal lobe. the part of the brain rostral to the ascending convolution. the lower lateral portion of the cerebral hemisphere.